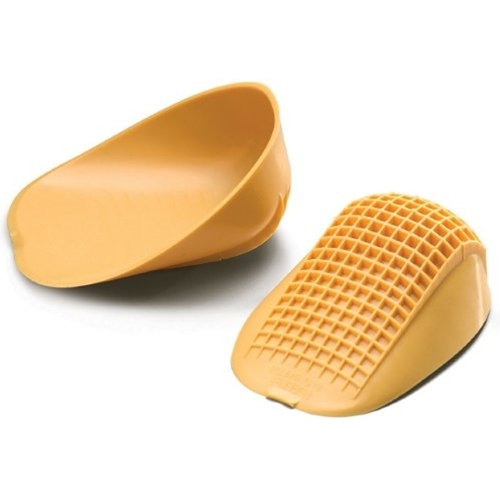 Tuli's Standard Heel Cups from HealthyKin.com use a unique waffle design to absorb shock and pressure at the heel. The standard style is used for all activities. After the second injection for a severe case of plantar fasciitis I was 90% better but couldn't get over the last 10%. The cups completely took care of that last 10%. I wear them all the time, even when just walking around the house. TIP: if you put them in your shoe them put on socks and put on the shoes, they often get twisted. Invert your sock to the heel, pull the sock on to the heel, put the cup on your heel and pull the socks on so that you are wearing the cups under your socks. I ordered these because they were supposed to bear more weight than the first ones I bought, but they are only larger and aren't as deeply waffled, so they actually are less supportive.